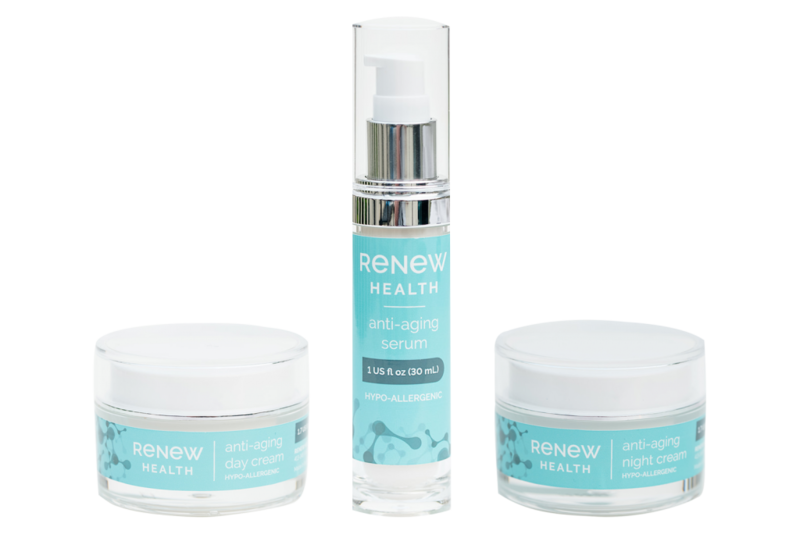 Breaking a new anti-aging skincare line into an extremely competitive ecommerce market. We had to figure out how we were going to tell the world what we already knew: that Renew Health does what other brands claim they do…only better and at a more affordable price point. Renew Health required proper branding and a kickass digital strategy, as it was to be sold mostly online with the exception of trade shows and the occasional retailer. A secret (digital) formula that required trust and testing. Our tried-and-true approach for clients with an established brand and a storefront wasn’t going to work for Renew Health. Enter Cody, our consultant. He knew first-hand how much time and money can be wasted on digital campaigns without the right approach. We worked with him on a previous ecommerce company, which he grew by 700% in two years purely through Facebook and Instagram ads after testing formulas and learning the tricks of the trade. While Cody brainstormed recommendations, our web team began optimizing the website to encourage sales. We also set up several email flows, drip campaigns and triggers which, depending on a user’s history with Renew Health, segmented audiences to receive different calls to action. For example, users add a product to their cart, but don’t end up purchasing, prompt a trigger for the “abandoned cart” flow. This automatically sends out a series of emails over a few days letting them know 1) they forgot something 2) their cart is expiring 3) we’ll give them a discount if they come back 4) their discount is expiring tonight. Identifying a realistic budget for social was next, taking into account our average order value (AOV), cost of product, gross margin, target cost per purchase, and our expected return on ad spend. Cody literally worked out a math equation with us that we put into testing. At any given time we are running 3 separate campaigns, all working towards the same goal. Cold traffic to get in front of new people, warm traffic to target those familiar with Renew Health, and retargeting to stay in front of our previous web visitors. Each ad set starts with the same creative, and changes based on response. While we normally track likes and comments, adds to cart and purchases are our performance targets for Renew Health. We determine which campaigns are successful by monitoring our cost per purchase (CPP), identifying which funnels are giving us CPP at or below our target. These ads get the green light to continue running. Anything costing us 105% to 145% more than anticipated we “yellow light”, meaning they can continue to run but we monitor their parameters closely. Last but not least, we “red light” sets by turning those off that are costing us over 145% of our target CPP. In this way, we’re encouraging the social algorithms to learn who our appropriate audience is along with us, rather than wasting dollars attracting the wrong people. Additionally, all ads are tracked with UTM (Urchin Tracking Monitor) codes to tell us where searchers came from. With our ad spend, creative, and audience demographics optimized, we’re receiving international sales on a daily basis. Ecommerce is a different beast and while there is no foolproof strategy, we’ve hit our stride. Have you checked out Renew Health yet? Let us know what you think.